I’ve added two new cards to my flag card collection: the flag of South Carolina and the flag of China. This card comes from a Chinese Postcrosser. This flag has been the national flag of the People’s Republic of China since 1949. This card comes from a private swap with Michael in South Carolina. The South Carolina flag shows a palmetto tree, which is the state tree. The flag doesn’t actually say “South Carolina” across the bottom, though. This design has been the state’s flag since 1861. Do you have a favorite flag? I like my state of Oregon’s flag, because it is the only US state flag to have a different design on each side. I can add a whole new country to my list. I received my first three cards from the Bahamas this week, from Niki. She sent a map for my map collection, a flag, and a flamingo. The Bahamas consist of more than 3,000 islands southeast of Florida and north of Cuba. They were a colony of Britain between 1718 and 1973. This is the flag of the Bahamas. The black triangle represents the unity of the Bahamian people. The three stripes represent the natural world of the Bahamas. The two turquoise stripes on the top and bottom represent the sea, the middle gold stripe, the land. Finally there is this card of the Caribbean or American flamingo. This is the only flamingo native to North America. The other stamp shows the desert rose, or Adenium obesum. These stamps show the Christmas tree worm, which is a worm that lives underwater. The things that look like Christmas trees are actually what it uses to breathe. The other stamp commemorates the 2012 Olympics. This one looks like it shows boxing. The first stamp here shows the barleria, a flowering shrub. The other stamp is from a series issued in 2012 to commemorate Queen Elizabeth’s Diamond Jubilee. It shows Prince Harry on his visit to the Bahamas as part of the Jubilee celebrations in March 2012. There are three other stamps in this issue, two more showing Prince Harry during other parts of his trip, and one showing the Queen. I am very happy to add another country to my received countries list. Thanks, Niki! 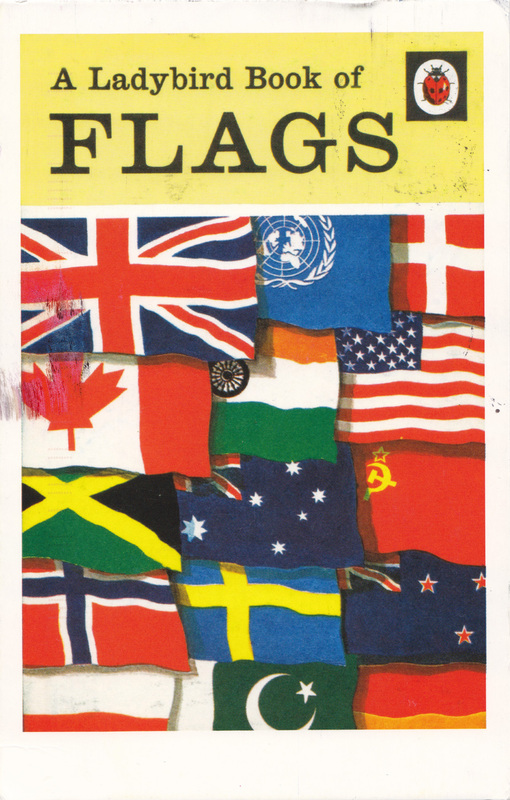 This card comes from Germany, but shows the flags of many nations, including the United Nations flag up at the top. Perhaps it can be a symbol of many nations coming together and setting aside war for a time. 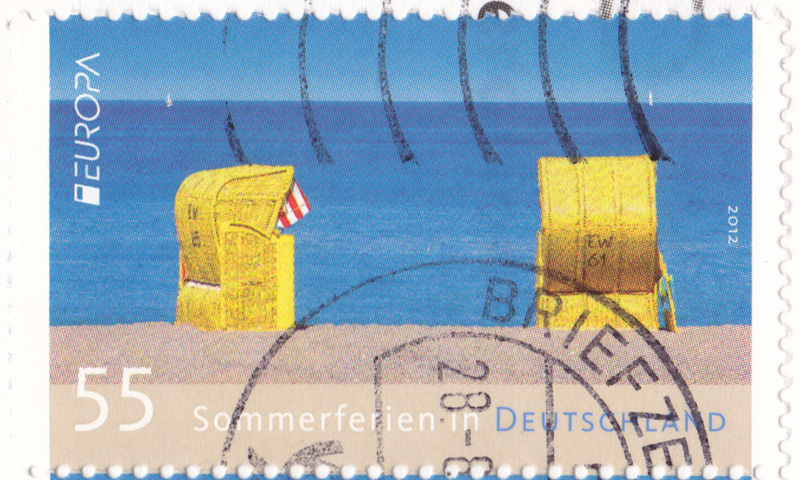 The stamp used celebrates a different kind of holiday, the summer holiday, but it is from 2012’s Europe stamp series. 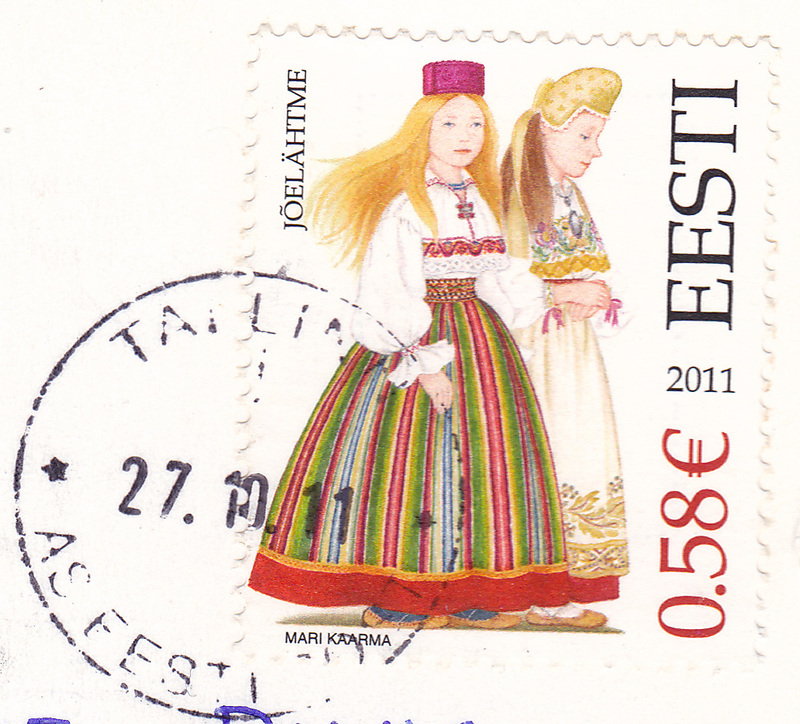 The Europa stamps also symbolize a coming together of nations for a common goal. 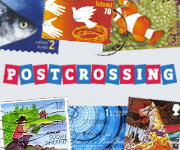 Though the goal of issuing themed stamps may seem kind of silly in comparison to ending war, certainly facilitating communication among countries through letters and the post contributes to peace among nations. Are you commemorating Remembrance Day in a postal way? I know a lot of programs for sending letters and packages to soldiers overseas in honor of Veterans’ Day. I hope everyone can send some peace in an envelope this year. From Kym in England, Jan Constantine Union Jack. Postcrossing NL-1158189 from the Netherlands. As you can see, the USA is not the only country that flies the red, white and blue. I’ve got some great United States posts coming up this week, though, featuring beautiful National Parks and Monuments, new state maps, and more. I’ve received only a handful of handmade cards so far, but this card that I received on Saturday really takes the cake! 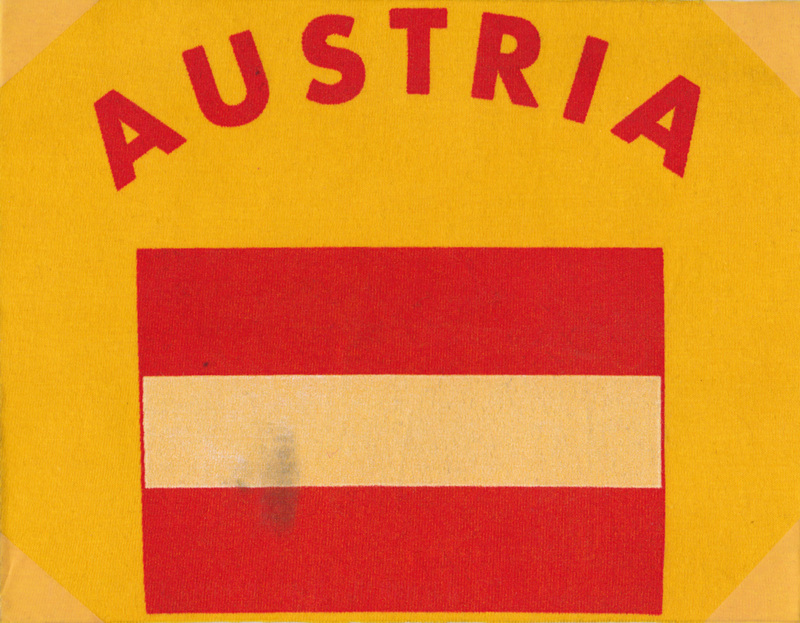 It is an official postcrossing card, and my first from Austria! 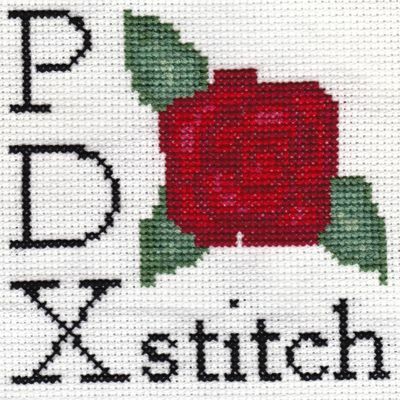 This card is huge: about 8 inches wide and 6 inches tall (20.3 by 15.3 cm)! The sender, Wolfgang, made it from an old T-shirt. It’s really soft and neat to feel! Postage stamps! Stickers! A drawing of Hello Kitty! Even an elephant! Wolfgang even points out where in Austria he lives. This is definitely the most thought-out card I think I’ve received so far. I wish I could favorite it twice! Thanks so much, Wolfgang! 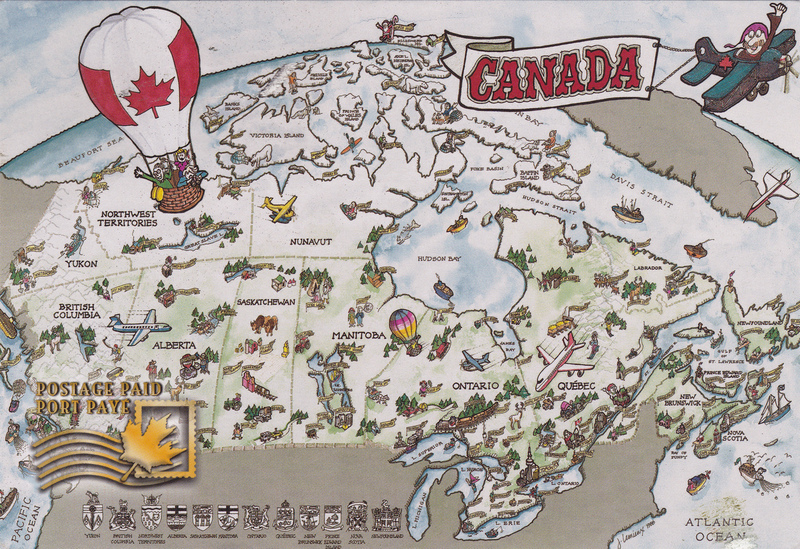 The Canadian flag comes from Pierre, in Ontario. 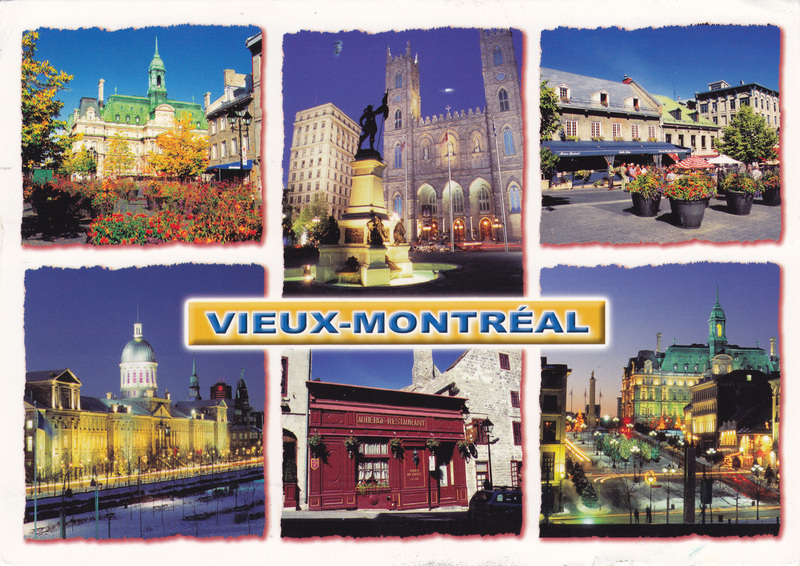 This view of Old Montréal comes from Hélène in (you guessed it) Montrèal, Québec! 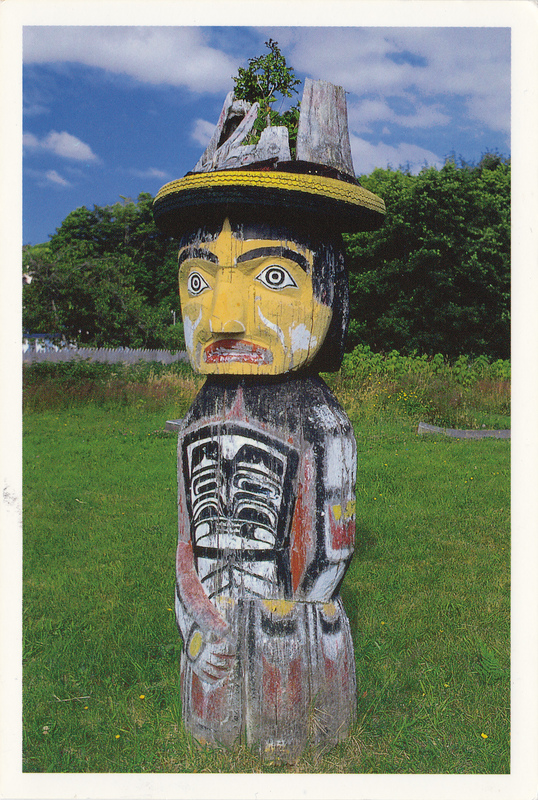 This pole in the Alert Bay cemetary was carved by Arthur Shaughnessy, commissioned by Mrs. Tom Patch for her memorial. Unsatisfied with the size of the figure’s hat she refused to pay for it, and it was abandoned on the beach. Years later some locals raised it at her grave, and eventually friends put a tire around the carved hat, enlarging it in accordance with her original wishes. 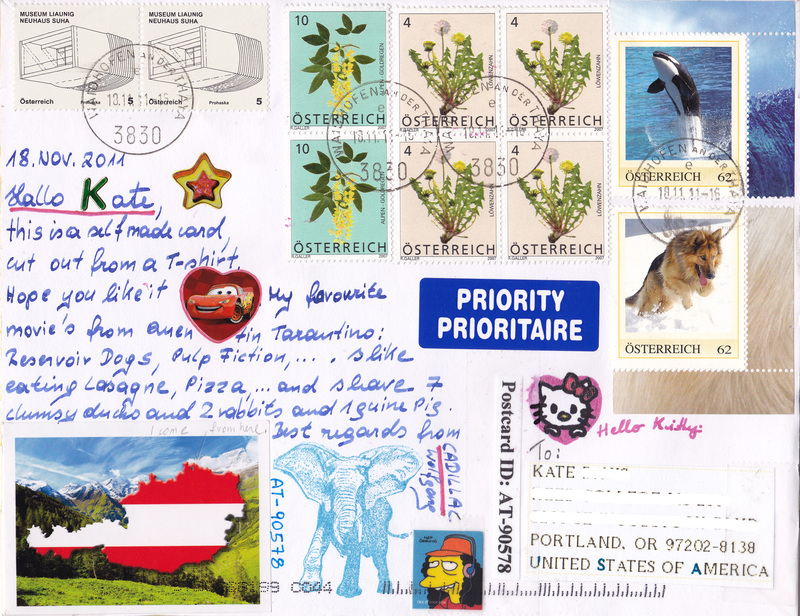 And, as with any new postcards from a new country, there are many stamps to share! 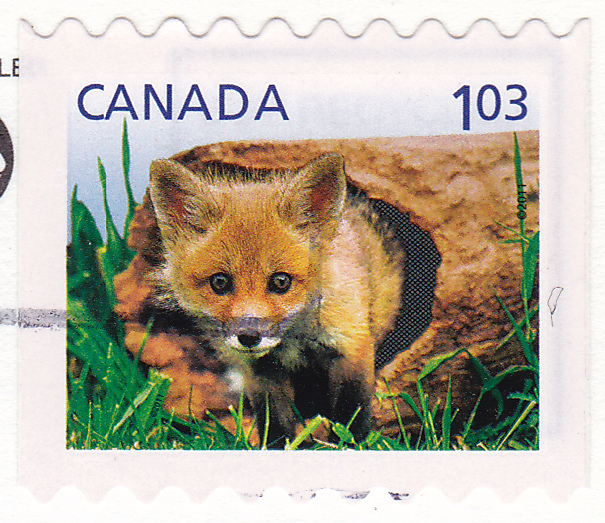 This fox stamp is so adorably small! It is about the size of a US quarter. I made a map of the countries from where I’ve received cards. The Americas are looking rather scant! 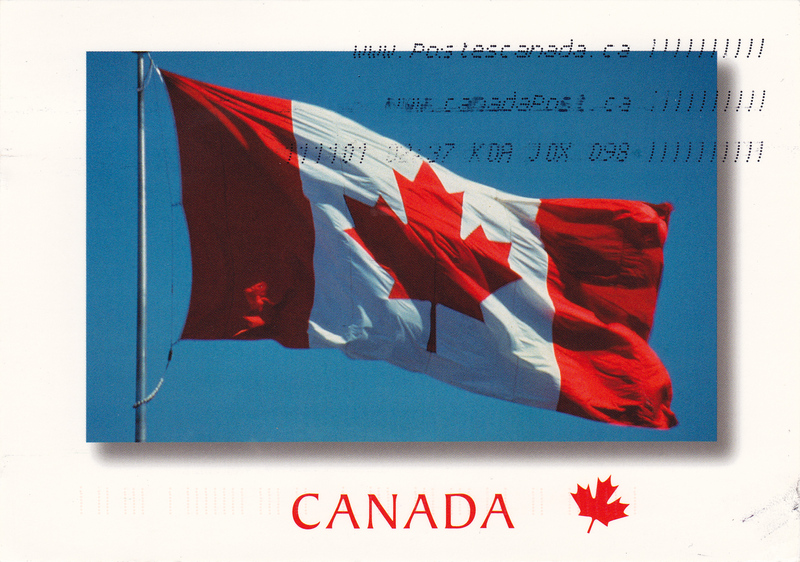 I have only received cards from the US and Canada. I have to get working on that! This is a lovely view from the Patkul terrace in Tallinn. The sender writes about her cats, named Panther and Ilves, which means lynx. 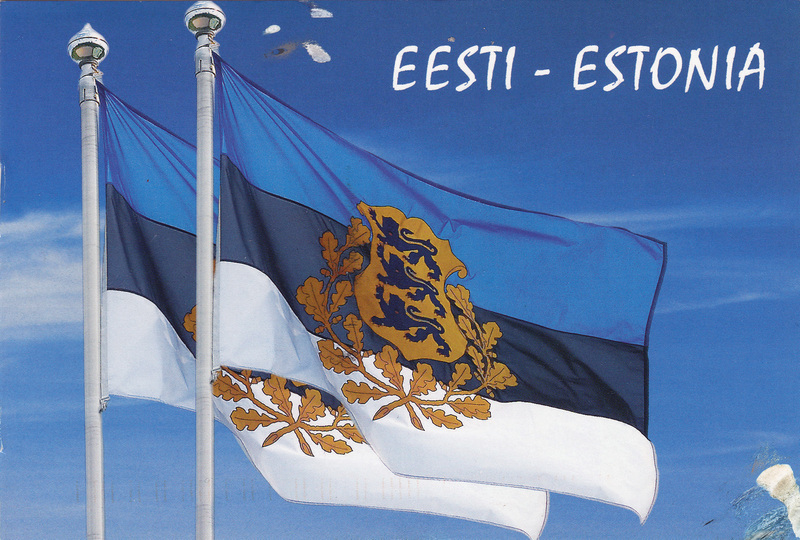 The next day this Estonian flag postcard arrived. The first card had such a happy message about cats, but on this card the sender wrote about how, under the Soviet Union, displaying this flag was banned and punishable by imprisonment. Reading this postcard made me so thankful that for my whole life, and the lives of my parents and grandparents, too, we have lived in a country that encourages freedom of speech and freedom of culture. We do not have to worry that we will be sent to prison for celebrating our heritage. I know that there are some in the United States who do want to suppress the cultures and religions of other people, especially people who are new here. I really hope that they stop, because expressing who you are and where you come from should not be an act of defiance. 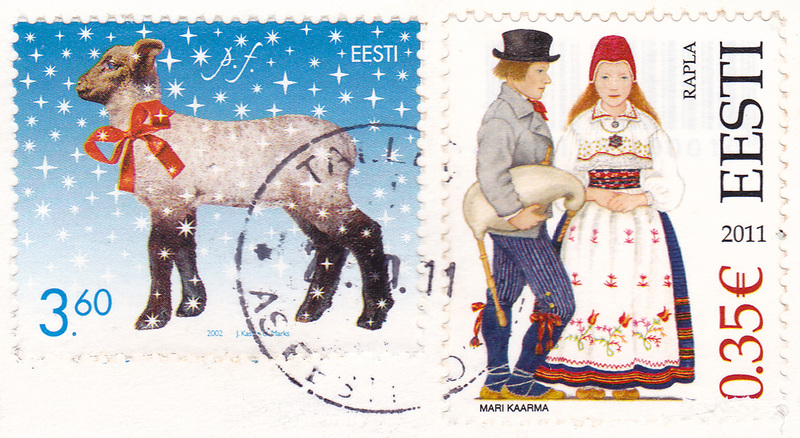 Well, that was my little sociopolitical rant; now have a look at these neat stamps!